It’s time to construct additional pylons portals, because this week’s Hearthstone Brawl brings a taste of StarCraft to our favorite card game. 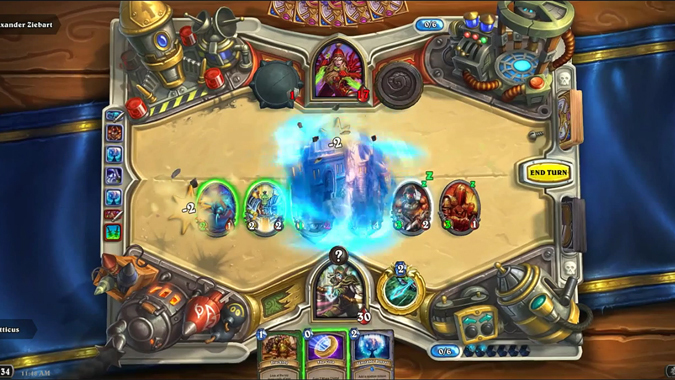 To celebrate StarCraft’s 20th anniversary, this Hearthstone brawl is the aptly named Portals to Another Dimension. So just how do you give this very Warcraft-themed game a StarCraft flair? With portals. Obviously. Tech: Mechs! Guns! Explosions! This portal brings victory via technology! Swarm: If it stalks, oozes toxic sludge, or has jagged spines, it might slither from beyond this portal. Mind: If it is psychic power you seek, find it by ascending through this portal. Once you’ve selected a portal, you’ll draw two new cards. They may or may not be portal cards, but since your deck is two-thirds portal cards, it’s pretty likely that you’ll get at least one portal. Each portal card costs 1 mana and adds a random card from that category to your hand — reducing its cost by 3 in when it does. That means mulligans are a little less important for this Brawl, since you’ll almost always have a 1-cost portal in your hand to play your first turn. And because these portals reduce the mana cost of your cards, you’ll get some good low cost cards to play with, even if your initial hand isn’t great. The downside, however, is you wind up with a ton of random cards, with no guarantee how well they’ll work together. For my part, I’ve found the Tech option to be the most useful, as it’s packed with mech minions that often buff one another. Swarm is also fun, with lots of ways to play with your minions — and it’s usually a game changer if you happen to draw Ultimate Infestation. Mind is the portal set I’ve had absolutely no luck with, but your mileage may vary. Though I thought we would have to carefully pick a class and a portal that worked well together, but in the end you have so many portal cards that your portal choice makes the biggest difference. Pick the portal that works best for you and get to it. As with every Brawl, all you have to do is win one match to reap the rewards. Usually you’ll earn a single Classic pack for winning a Brawl, but this week you’ll get three Kobolds and Catacombs packs instead. Unless this Brawl turns out to be a frustrating nightmare, that’s not too shabby. The Brawl is available now and runs until March 25. So hop online and throw down some portals!